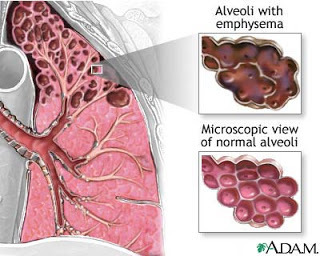 Emphysema is the enlargement and destruction of the alveolar, bronchial, and bronchiolar tissue with resultant loss of recoil, air trapping, thoracic overdistention, sputum accumulation, and loss of diaphragmatic muscle tone. These changes cause a state of carbon dioxide retention,hypoxia, and respiratory acidosis. The actual cause of emphysema is unknown. Risk factors for the development of emphysema include cigarette smoking, living or working in a highly polluted area, and a family history of pulmonary disease. Frequent childhood pulmonary infections have been identified as a cause of bronchiectasis. Feeling of breathlessness,cough, sputum production, flaring of the nostrils, use of accessory muscles of respiration, increased rate and depth of breathing, dyspnea. Evaluation entails primarily chest x-rays, chest computed tomography (CT) scans, pulmonary function tests, pulse oximetry, blood gases, and complete blood count. The major goals of medical management are to improve quality of life, slow progression of the disease, and treat obstructed airways to relieve hypoxia. Treatment is directed at improving ventilation, decreasing work of breathing and preventing infection. Bronchodilators and metered-dose inhalers (aerosol therapy, dispensing particles in fine mist). Oxygenation in low concentrations for severe hypoxemia. Bronchodilators: Anticholinergic agents such as atropine sulfate, ipratropium bromide are used in reversal of bronchoconstriction. Other Drug Therapy: Bronchodilators, which are used for prevention and maintenance therapy, can be administered as aerosols or oral medications. Generally, inhaled anticholinergic agents are the first-line therapy for emphysema, with the addition of betaadrenergic agonists added in a stepwise fashion. Antibiotics are ordered if a secondary infection develops. As a preventive measure, influenza and pneumonia vaccines are administered. Maintaining a patent airway is a priority. Use a humidifier at night to help the patient mobilize secretions in the morning. Encourage the patient to use controlled coughing to clear secretions that might have collected in the lungs during sleep. Instruct the patient to sit at the bedside or in a comfortable chair, hug a pillow, bend the head downward a little, take several deep breaths, and cough strongly. Place patients who are experiencing dyspnea in a high Fowler position to improve lung expansion. Placing pillows on the overhead table and having the patient lean over in the orthopneic position may also be helpful. Teach the patient pursed-lip and diaphragmatic breathing. To avoid infection, screen visitors for contagious diseases and instruct the patient to avoid crowds. Conserve the patient’s energy in every possible way. Plan activities to allow for rest periods, eliminating nonessential procedures until the patient is stronger. It may be necessary to assist with the activities of daily living and to anticipate the patient’s needs by having supplies within easy reach. Refer the patient to a pulmonary rehabilitation program if one is available in the community. Patient education is vital to long-term management. Teach the patient about the disease and its implications for lifestyle changes, such as avoidance of cigarette smoke and other irritants, activity alterations, and any necessary occupational changes. Provide information to the patient and family about medications and equipment. Be sure the patient and family understand any medication prescribed, including dosage, route, action, and side effects. Instruct the patient to report any signs and symptoms of infection to the primary healthcare provider. Explain necessary dietary adjustments to the patient and family. Recommend eating small, frequent meals, including high-protein, high-density foods. Encourage the patient to plan rest periods around his or her activities, conserving as much energy as possible. Arrange for return demonstrations of equipment used by the patient and family. If the patient requires home oxygen therapy, refer the patient to the appropriate rental service, and explain the hazards of combustion and increasing the flow rate without consultation from the primary healthcare provider. Once diagnosed with emphysema, the disease state is constant. The disease state is progressive. Even though it cannot be stopped it can be slowed with treatment. The inhalation of environmental air pollutants in the #1 cause of emphysema cases. Mr. Vasquez 56-year-old client with a 40-year history of smoking one to two packs of cigarettes per day has a chronic cough producing thick sputum, peripheral edema and cyanotic nail beds. Based on this information, he most likely has which of the following conditions? Because of this extensive smoking history and symptoms the client most likely has chronic obstructive bronchitis. Client with ARDS have acute symptoms of hypoxia and typically need large amounts of oxygen. Clients with asthma and emphysema tend not to have chronic cough or peripheral edema. A lung transplant is the only way to slow the progression of emphysema. Air flows through the trachea into the left and right bronchi upon inspiration. There is no cure but the symptoms can be treated and progression of the disease can be slowed. Carbon monoxide is the waste product expelled from the body when you breathe out. A male client with emphysema becomes restless and confused. What step should nurse Jasmine take next? Assess the client’s potassium level. Encourage the client to perform pursed lip breathing. Increase the client’s oxygen flow rate. Purse lip breathing prevents the collapse of lung unit and helps client control rate and depth of breathing. A person with emphysema will not exhibit noticeable symptoms. Emphysema, Asthma and Chronic Bronchitis are disease under COPD. This NCP covers the emphysema and the other two COPD diseases. Maintain airway patency with breath sounds clear/clearing. Demonstrate behaviors to improve airway clearance, e.g., cough effectively and expectorate secretions. Auscultate breath sounds. Note adventitious breath sounds (wheezes, crackles, rhonchi). Rationale: Some degree of bronchospasm is present with obstructions in airway and may or may not be manifested in adventitious breath sounds such as scattered, moist crackles (bronchitis); faint sounds, with expiratory wheezes (emphysema); or absent breath sounds (severe asthma). Assess and monitor respirations and breath sounds, noting rate and sounds (tachypnea, stridor, crackles, wheezes). Note inspiratory and expiratory ratio. Rationale: Tachypnea is usually present to some degree and may be pronounced on admission or during stress or concurrent acute infectious process. Respirations may be shallow and rapid, with prolonged expiration in comparison to inspiration. Note presence and degree of dyspnea as for reports of “air hunger,” restlessness, anxiety, respiratory distress, use of accessory muscles. Use 0–10 scale or American Thoracic Society’s “Grade of Breathlessness Scale” to rate breathing difficulty. Ascertain precipitating factors when possible. Differentiate acute episode from exacerbation of chronic dyspnea. Rationale: Respiratory dysfunction is variable depending on the underlying process such as infection, allergic reaction, and the stage of chronicity in a patient with established COPD. Note: Using a 0–10 scale to rate dyspnea aids in quantifying and tracking changes in respiratory distress. Rapid onset of acute dyspnea may reflect pulmonary embolus. Assist patient to assume position of comfort (elevate head of bed, have patient lean on overbed table or sit on edge of bed). Rationale: Elevation of the head of the bed facilitates respiratory function by use of gravity; however, patient in severe distress will seek the position that most eases breathing. Supporting arms and legs with table, pillows, and so on helps reduce muscle fatigue and can aid chest expansion. Keep environmental pollution to a minimum such as dust, smoke, and feather pillows, according to individual situation. Rationale: Precipitators of allergic type of respiratory reactions that can trigger or exacerbate onset of acute episode. Encourage abdominal or pursed-lip breathing exercises. Rationale: Provides patient with some means to cope with or control dyspnea and reduce air-trapping. Observe characteristics of cough (persistent, hacking, moist). Assist with measures to improve effectiveness of cough effort. Rationale: Cough can be persistent but ineffective, especially if patient is elderly, acutely ill, or debilitated. Coughing is most effective in an upright or in a head-down position after chest percussion. Increase fluid intake to 3000 mL per day within cardiac tolerance. Provide warm or tepid liquids. Recommend intake of fluids between, instead of during, meals. Rationale: Hydration helps decrease the viscosity of secretions, facilitating expectoration. Using warm liquids may decrease bronchospasm. Fluids during meals can increase gastric distension and pressure on the diaphragm. Monitor and graph serial ABGs, pulse oximetry, chest x-ray. Rationale: Establishes baseline for monitoring progression or regression of disease process an complications. Note: Pulse oximetry readings detect changes in saturation as they are happening, helping to identify trends before patient is symptomatic. However, studies have shown that the accuracy of pulse oximetry may be questioned if patient has severe peripheral vasoconstriction. Demonstrate improved ventilation and adequate oxygenation of tissues by ABGs within patient’s normal range and be free of symptoms of respiratory distress. Assess and record respiratory rate, depth. Note use of accessory muscles, pursed-lip breathing, inability to speak or converse. Rationale: Useful in evaluating the degree of respiratory distress or chronicity of the disease process. Elevate head of bed, assist patient to assume position to ease work of breathing. Include periods of time in prone position as tolerated. Encourage deep-slow or pursed-lip breathing as individually needed or tolerated. Rationale: Oxygen delivery may be improved by upright position and breathing exercises to decrease airway collapse, dyspnea, and work of breathing. Note: Recent research supports use of prone position to increase Pao2. Assess and routinely monitor skin and mucous membrane color. Rationale: Cyanosis may be peripheral (noted in nailbeds) or central (noted around lips/or earlobes). Duskiness and central cyanosis indicate advanced hypoxemia. Encourage expectoration of sputum; suction when indicated. Rationale: Thick, tenacious, copious secretions are a major source of impaired gas exchange in small airways. Deep suctioning may be required when cough is ineffective for expectoration of secretions. Auscultate breath sounds, noting areas of decreased airflow and adventitious sounds. Rationale: Breath sounds may be faint because of decreased airflow or areas of consolidation. Presence of wheezes may indicate bronchospasm or retained secretions. Scattered moist crackles may indicate interstitial fluid or cardiac decompensation. Rationale: Decrease of vibratory tremors suggests fluid collection or air-trapping. Monitor level of consciousness and mental status. Investigate changes. Rationale: Restlessness and anxiety are common manifestations of hypoxia. Worsening ABGs accompanied by confusion/ somnolence are indicative of cerebral dysfunction due to hypoxemia. Evaluate level of activity tolerance. Provide calm, quiet environment. Limit patient’s activity or encourage bed or chair rest during acute phase. Have patient resume activity gradually and increase as individually tolerated. Rationale: During severe, acute or refractory respiratory distress, patient may be totally unable to perform basic self-care activities because of hypoxemia and dyspnea. Rest interspersed with care activities remains an important part of treatment regimen. An exercise program is aimed at increasing endurance and strength without causing severe dyspnea and can enhance sense of well-being. Evaluate sleep patterns, note reports of difficulties and whether patient feels well rested. Provide quiet environment, group care or monitoring activities to allow periods of uninterrupted sleep; limit stimulants such as caffeine; encourage position of comfort. Rationale: Multiple external stimuli and presence of dyspnea may prevent relaxation and inhibit sleep. Rationale: Tachycardia, dysrhythmias, and changes in BP can reflect effect of systemic hypoxemia on cardiac function. Demonstrate behaviors/lifestyle changes to regain and/or maintain appropriate weight. Rationale: To determine informational needs of client and SO. Assess dietary habits, recent food intake. Note degree of difficulty with eating. Evaluate weight and body size (mass). Rationale: Patient in acute respiratory distress is often anorectic because of dyspnea, sputum production, and medications. In addition, many COPD patients habitually eat poorly, even though respiratory insufficiency creates a hypermetabolic state with increased caloric needs. As a result, patient often is admitted with some degree of malnutrition. People who have emphysema are often thin with wasted musculature. Rationale: Diminished or hypoactive bowel sounds may reflect decreased gastric motility and constipation (common complication) related to limited fluid intake, poor food choices, decreased activity, and hypoxemia. Give frequent oral care, remove expectorated secretions promptly, provide specific container for disposal of secretions and tissues. Rationale: Noxious tastes, smells, and sights are prime deterrents to appetite and can produce nausea and vomiting with increased respiratory difficulty. Encourage a rest period of 1 hr before and after meals. Provide frequent small feedings. Rationale: Helps reduce fatigue during mealtime, and provides opportunity to increase total caloric intake. Avoid gas-producing foods and carbonated beverages. Rationale: Can produce abdominal distension, which hampers abdominal breathing and diaphragmatic movement and can increase dyspnea. Rationale: Extremes in temperature can precipitate or aggravate coughing spasms. Rationale: Useful in determining caloric needs, setting weight goal, and evaluating adequacy of nutritional plan. Note:Weight loss may continue initially, despite adequate intake, as edema is resolving. Administer supplemental oxygen during meals as indicated. Rationale: Decreases dyspnea and increases energy for eating, enhancing intake. Verbalize understanding of individual causative/risk factors. Identify interventions to prevent/reduce risk of infection. Demonstrate techniques, lifestyle changes to promote safe environment. Rationale: Fever may be present because of infection or dehydration. Review importance of breathing exercises, effective cough, frequent position changes, and adequate fluid intake. Rationale: These activities promote mobilization and expectoration of secretions to reduce risk of developing pulmonary infection. Observe color, character, odor of sputum. Rationale: Odorous, yellow, or greenish secretions suggest the presence of pulmonary infection. Demonstrate and assist patient in disposal of tissues and sputum. Stress proper handwashing (nurse and patient), and use gloves when handling or disposing of tissues, sputum containers. Rationale: Prevents spread of fluid-borne pathogens. Monitor visitors; provide masks as indicated. Rationale: Reduces potential for exposure to infectious illnesses such as upper respiratory infection (URI). Encourage balance between activity and rest. Rationale: Reduces oxygen consumption or demand imbalance, and improves patient’s resistance to infection, promoting healing. Discuss need for adequate nutritional intake. Rationale: Malnutrition can affect general well-being and lower resistance to infection. Recommend rinsing mouth with water and spitting, not swallowing, or use of spacer on mouthpiece of inhaled corticosteroids. Rationale: Reduces localized immunosuppressive effect of drug and risk of oral candidiasis. Obtain sputum specimen by deep coughing or suctioning for Gram’s stain, culture and sensitivity. Rationale: Done to identify causative organism and susceptibility to various antimicrobials. Rationale: May be given for specific organisms identified by culture and sensitivity, or be given prophylactically because of high risk. Identify relationship of current signs/symptoms to the disease process and correlate these with causative factors. Explain and reinforce explanations of individual disease process. Encourage patient and SO to ask questions. Rationale: Decreases anxiety and can lead to improved participation in treatment plan. Instruct and reinforce rationale for breathing exercises, coughing effectively, and general conditioning exercises. Rationale: Pursed-lip and abdominal or diaphragmatic breathing exercises strengthen muscles of respiration, help minimize collapse of small airways, and provide the individual with means to control dyspnea. General conditioning exercises increase activity tolerance, muscle strength, and sense of well-being. Stress importance of oral care and dental hygiene. Rationale: Decreases bacterial growth in the mouth, which can lead to pulmonary infections. Discuss importance of avoiding people with active respiratory infections. Stress need for routine influenza and pneumococcal vaccinations. Rationale: Decreases exposure to and incidence of acquired acute URIs. Discuss individual factors that may trigger or aggravate condition (excessively dry air, wind, environmental temperature extremes, pollen, tobacco smoke, aerosol sprays, air pollution). Encourage patient and SO to explore ways to control these factors in and around the home and work setting. Rationale: These environmental factors can induce or aggravate bronchial irritation, leading to increased secretion production and airway blockage. Review the harmful effects of smoking, and advise cessation of smoking by patient and SO. Rationale: Cessation of smoking may slow or halt progression of COPD. Even when patient wants to stop smoking, support groups and medical monitoring may be needed. Note: Research studies suggest that “side-stream” or “second-hand” smoke can be as detrimental as actually smoking. Provide information about activity limitations and alternating activities with rest periods to prevent fatigue; ways to conserve energy during activities (pulling instead of pushing, sitting instead of standing while performing tasks); use of pursed-lip breathing, side-lying position, and possible need for supplemental oxygen during sexual activity. Rationale: Having this knowledge can enable patient to make informed choices or decisions to reduce dyspnea, maximize activity level, perform most desired activities, and prevent complications. Discuss importance of medical follow-up care, periodic chest x-rays, sputum cultures. Rationale: Monitoring disease process allows for alterations in therapeutic regimen to meet changing needs and may help prevent complications. Review oxygen requirements and dosage for patient who is discharged on supplemental oxygen. Discuss safe use of oxygen and refer to supplier as indicated. Rationale: Reduces risk of misuse (too little or too much) and resultant complications. Promotes environmental and physical safety. Instruct patient and SO in use of NIPPV as appropriate. Problem-solve possible side effects and identify adverse signs and symptoms (increased dyspnea, fatigue, daytime drowsiness, or headaches on awakening). Rationale: NIPPV may be used at night or periodically during day to decrease CO2 level, improve quality of sleep, and enhance functional level during the day. Signs of increasing CO2 level indicate need for more aggressive therapy. Instruct asthmatic patient in use of peak flow meter, as appropriate. Rationale: Peak flow level can drop before patient exhibits any signs and symptoms of asthma during the “first time” after exposure to a trigger. Regular use of the peak flow meter may reduce the severity of the attack because of earlier intervention. Provide information and encourage participation in support groups (American Lung Association, public health department). Rationale: These patients and their SOs may experience anxiety, depression, and other reactions as they deal with a chronic disease that has an impact on their desired lifestyle. Support groups or home visits may be desired or needed to provide assistance, emotional support, and respite care. Refer for evaluation of home care if indicated. Provide a detailed plan of care and baseline physical assessment to home care nurse as needed on discharge from acute care. Rationale: Provides for continuity of care. May help reduce frequency of rehospitalization. Discuss respiratory medications, side effects, adverse reactions. Rationale: Frequently these patients are simultaneously on several respiratory drugs that have similar side effects and potential drug interactions. It is important that patient understand the difference between nuisance side effects (medication continued) and untoward or adverse side effects (medication possibly discontinued or dosage changed). Demonstrate technique for using a metered-dose inhaler (MDI), such as how to hold it, taking 2–5 min between puffs, cleaning the inhaler. Rationale: Proper administration of drug enhances delivery and effectiveness. Devise system for recording prescribed intermittent drug and inhaler usage. Rationale: Reduces risk of improper use and overdosage of prn medications, especially during acute exacerbations, when cognition may be impaired. Recommend avoidance of sedative antianxiety agents unless specifically prescribed or approved by physician treating respiratory condition. Rationale: Although patient may be nervous and feel the need for sedatives, these can depress respiratory drive and protective cough mechanisms. Note: These drugs may be used prophylactically when patient is unable to avoid situations known to increase stress or trigger respiratory response.